Video of Chicago police questioning Mickiael Ward on Feb. 10, 2013 in the fatal shooting of 15-year-old Hadiya Pendleton. CHICAGO (WLS) -- A video of Mickiael Ward confessing to the fatal shooting of 15-year-old Hadiya Pendleton was played in court Tuesday on Day 6 of the trial. 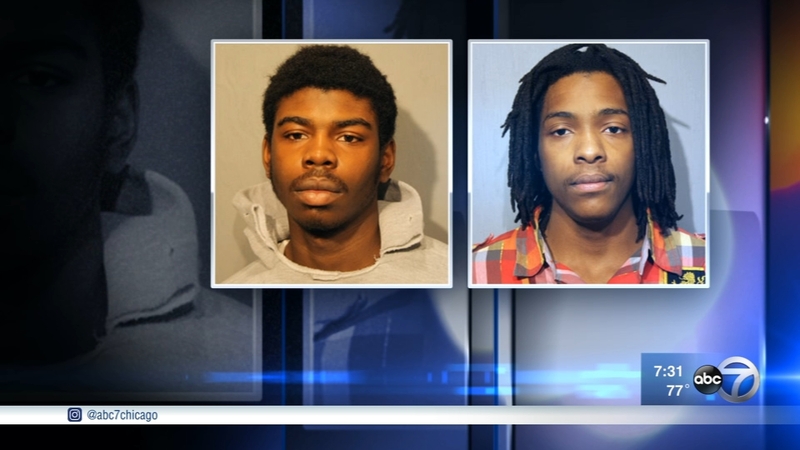 Ward and Kenneth Williams are charged in the murder of the teen at a South Side park. In multiple hours of video, Ward -- then 18 years old -- was shown being questioned by two sets of detectives in a small, windowless room more than a week after the Jan. 29, 2013 shooting. Ward's defense attorney contends that the confession was coerced after 17 hours of questions. In the video, Ward tells detectives that he was forced to shoot into the park by co-defendant Williams, adding that he did not expect that Pendleton or anyone other than rivals would be there. The interrogation videos starts in the early hours of Feb. 10, 2013, continuing again at about 3:17 a.m. and then again at 12:31 p.m. In the video, the detectives tell Ward that they have video of him on the day of the shooting and that he has already been identified in a photo lineup. At one point, Ward tells them that he "wasn't even at the park." Initially, he tells police that he was picking up his little brother from school and then picked up other friends in his mother's white Nissan. Detectives tell him that they believe that the shooting was in retaliation for Williams previously getting shot by someone in the 4-6 Terror gang. They tell Ward that they believe he didn't mean to kill the young girl who had a bright future. The second pair of detectives encourage Ward to tell his side of the story. He continues to be defiant, stating "Nobody ever plans on killing no 15-year-old girl ... I ain't kill no 15-year-old girl." But then, he starts to open up, admitting that there was a gun. Defense attorneys questioned the tactics of the lead detective, pointing out that he is known for working for disgraced Chicago police Cmdr. Jon Burge. Closing arguments are expected on Wednesday. Prosecution rested its case against Kenneth Williams on Monday. Hadiya Pendleton's mother, Cleopatra Cowley, testified at the tiral of two men accused of murdering her 15-year-old daughter. On Monday, Pendleton's mother, Cleopatra Cowley, testified about the moment she learned her daughter had been shot and killed. Cowley recounted the painful details of that day when she learned that her 15-year-old daughter had been shot. Cowley said at first, she couldn't believe that it was true. "I held the phone until I could get her to speak with me, and then that's when she indicated Hadiya had been shot. I didn't understand that, because it just didn't make any sense. I couldn't understand what they were saying because I didn't understand why my daughter had been shot. It's not something I feared, ever," Cowley said. Prosecutors said Pendleton was not the intended target. They said the sophomore honors student was taking shelter from the rain with friends in Harsh Park when defendant Ward got out of a car driven by defendant Williams and opened fire. The park is located in about a mile from former President Barack Obama's home in Chicago's Kenwood neighborhood. Pendleton had performed at Obama's second inauguration days before she was killed. Pendleton was still alive when Cowley arrived at Comer Children's Hospital. But soon after, she learned her daughter had died of a gunshot wound to the back.